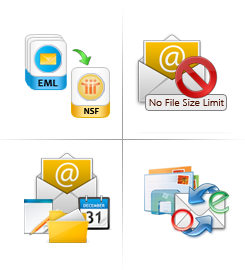 EML to Lotus Notes converter enables the users to choose the entire folder of EML files at once. The tool creates an individual NSF file containing all the lotus notes emails saved in it. Also, while saving EML files to NSF tool keeps the attachments embedded within NSF emails. All the Meta information of the emails remains as it is. Emails are composed of various email addresses in to, Cc, Bcc, hyperlinks, images and other metadata. This tool does not make any alteration to the original data while converting EML file to NSF format. It keeps data intact. EML to Lotus Notes NSF converter maintains the HTML integrity and formatting as well. The tool provides an option to maintain HTML formatting or not. Users have to click on ‘Yes’ or ‘No’. However, they can enable or disable this feature any time as per requirement. Moreover, the tool keeps meta properties intact. The software EML to Lotus Notes NSF converter enables the users to save Lotus Notes NSF file at any desired location. However, if user wants to create New folder then, they can easily do it right from the software panel with desired name and save file into it. This makes tool most reliable and efficient. While converting EML files to Lotus Notes tool allows the users to save resultant NSF file with an appropriate name. Whatever name the user give is used by the software to save lotus notes NSF file. EML to Lotus Notes converter generates the concise export report. It contains details like; the name of the folder being converted, EML file name being exported, and the converted email count. The application serves all its intended purpose quite efficiently and helps you to carry out the conversion process in smooth manner. Every issue has been taken care of that most administrators faces when doing the conversion process. Let you batch convert EML to Lotus Notes NSF instantly. Maintain email integrity and gives you all emails with their associated attachments. No file size limitation which gives you the flexibility to convert huge data easily. Specially good for those email environment who wants to migrate from Windows Live Mail, Outlook Express or other emailing system that creates .eml to store email information. Track and monitor all the conversion report and get minute by minute update of your EML to NSF conversion. This really helps when you know that the whole process might take the certain time and you can utilize the idle time more productively. The software also boosts of many features that might come crucial when during the conversion process. Ability to maintain the HTML Formatting when making the conversion process. Universal installation on Windows Operating System. Lotus Notes application needs to be installed on the machine where conversion will take place as the software inherits many of its features that helps during the whole process. Know the process completion time when doing the EML to NSF conversation process. 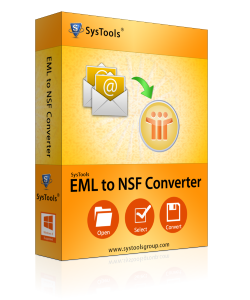 Demo version of EML to NSF Converter allows you to convert and save 50 EML files to NSF. How can I import EML to Lotus Notes NSF? Can I convert multiple EML files to Lotus Notes? Yes, of course, software EML to NSF converter is fully equipped to perform the batch conversion process of all the emails hence you don't have to worry at all and the software will significantly reduce the overall conversion time. Will this tool export EML files attachments also? Yes, of course, this EML to NSF exporter converted emails as well as attachments to NSF format. How many EML files can be converted by this tool? You can add any number of EML files to the tool. This software does not impose any file size and number limit. It can convert unlimited EML files to Lotus Notes NSF. Can I convert Windows Live Mail EML file to NSF? Yes, of course, you can convert EML files created from Windows Live Mail, Outlook Express, Windows Mail to NSF format by this tool. Is there any need to install Lotus Notes on the machine? Yes, it is necessary to install and configure Lotus Notes 9.0 or below versions on the machine.